PhET simulations are free, online interactive simulations for teaching and learning science. The simulations emphasize visual models, cause-and-effect relationships, and multiple representations. The simulations are most effective when students can engage with them one-on-one, or in small groups. Such interaction is possible in a lab or recitation, as well as a classroom setting with worksheets, or on homework. This recommendation will discuss the use of PhET in labs. Click here to see all Expert Recommendations on the use of PhET. Why use PhET in a lab setting? New possibilities for experiments. 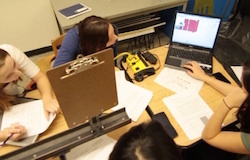 Labs using PhET simulations allow students to engage in explorations that would not be possible or practical with real equipment. For example, in Energy Skate Park, students can change the shape of the track, starting height of the skater, friction, and the acceleration due to gravity. Experiments in quantum mechanics. PhET simulations also allow experimentation in the realm of quantum physics, including recreation of classic experiments, such as the photoelectric effect [McKagan et al. 2009], and the Stern-Gerlach experiment. You can see all our simulations on quantum phenomena here. Quick repeatability. PhET simulations allow easy, accurate repeatability (e.g., the skater can always be started from the same point), so that the effect of many different parameters can be accurately explored. Embedded measurement tools. Many PhET simulations include a variety of measurement tools, such as voltmeters, energy graphs, stopwatches, and rulers, and so lend themselves well to laboratory-style experiments. Lack of experimental “noise” effects. Benchtop experiments can often be confusing to students, because of the presence of experimental “noise” (friction, table vibrations, measurement error, etc.). While it is often important that students learn to deal with such noise effects and experimental error, these factors can be confusing and obscure the fundamental relationships. For example, students can have trouble seeing whether a bulb is weakly lit in a real circuit, but this is more easily visible in a simulation [Finkelstein et al. 2005]. The “perfect world” of the simulation can often help students master these ideas, before observing them in the messier, real world. Underlying mechanisms made visible. PhET simulations are designed to make scientific models visible, so they help students understand not just what is happening, but why. For example, electron flow in a circuit is visible in the Circuit Construction Kit, so students can observe how that flow changes under different conditions, and that current is the same on either side of a resistor. Can PhET replace real equipment? Sometimes. Our studies have shown that PhET sims are very effective for conceptual understanding [Perkins et al. 2012, Adams et al. 2008, Podolefsky et al. 2010, Wieman et al. 2008]. 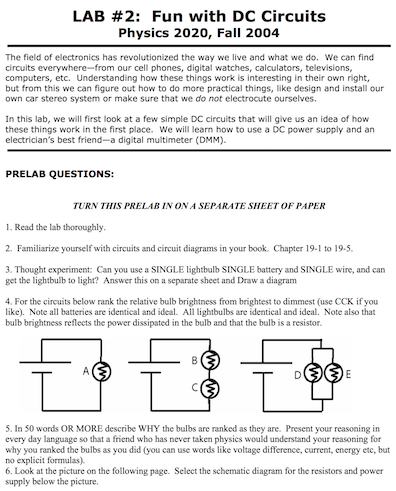 In one early study, we found that students using our Circuit Construction Kit were better able to both answer conceptual questions about circuits, and to put together a real circuit [Finkelstein et al. 2005]. However, there are many goals of hands-on labs that simulations do not address, such as specific skills relating to the functioning of equipment, or how to deal with experimental “noise” or error. Depending on the goals of your laboratory, it may be more effective to use the simulation on its’ own, or a combination of sims and real equipment. Indeed, at the University of Colorado we use a combination of the Circuit Construction Kit and real equipment in our labs. How can I write a lab using PhET? The principles of writing a PhET-based lab activity are very similar to that for writing an activity for in-class use. Please see our article on activity design for suggestions on writing PhET-based laboratories, including examples of activities that do and do not use real equipment. Note that you can also use PhET as a pre-lab assignment, or a follow-up assignment, such as a homework question. Many PhET simulations relate to the conceptual learning goals for lab activities, so the simulations can pair very effectively as a pre- or post-lab assignment. How can I facilitate a lab using PhET? Again, our recommendations for facilitating labs using PhET are similar to our suggestions for facilitating in-class use of simulation activities. See our guidelines for activity facilitation for suggestions. If you are using Teaching Assistants for activity facilitation (e.g., in a lab or recitation), make sure to share those facilitation tips with them. It is best if you can plan a practice session, where all teaching assistants go through the activity as if they were students.